When and where did the guttural 'r' originate? I have often wondered why French is (almost) unique in the Romance languages in using the guttural 'r' – in particular, the uvular fricative. Apart from Piedmontese / Piedmontese Italian (and even there it's far from universal), French seems to be the only Romance language that uses this sound, whilst many Germanic languages and dialects use it commonly. Occitan on the other hand did and even now does not use it, as far as I can tell, and many Southern French speakers still tend to employ the more traditional Latin alveolar sounds when speaking Standard French. Now, I came across this curious map of the distribution of uvular rhotic usage in Western Europe, which shows a clear geographical cluster. Most surprisingly though, areas of common usage appear to cross significant linguistic boundaries (Romance-Germanic) quite freely! Initially, I thought the guttural 'r' might have been an old Germanic feature that spread into French, even as far back as the Franks perhaps (which would certainly explain its greater prevalence in the north of the country), but there is apparently clear evidence (from Molière, no less) that as late as the 18th century in Paris, the alveolar trill was being used to pronounce 'r'. Hence I wonder, is this phonology truly a modern innovation? If so, where and precisely when did it originate? And how did it cross the linguistic barrier so that it permeated both Romance dialects and High German, Dutch, and the North Germanic languages so thoroughly? I presume that these phonologies are not independent, but perchance even this premise is wrong. The short answer is that the uvular R of, say, German and Dutch is probably in origin an independent development from the French uvular (as it is in Northumbrian English.) It is true that the eventual rise of the Parisian uvular is what helped it to spread. Were it not for the rise of the Parisian /ʀ/ in the 19th century, uvular Rs throughout Continental Europe might well be consigned to low-prestige accents and dialects today, as they still are in Northern England and seem to have been before 1800. Continental uvularization — although it is traditionally assumed to have simply spread from 19th century Parisian French by prestige influence — is a complex process, and its early stages are probably quite old. It almost certainly has multiple inputs and sources, even if Parisian uvularization helped it along in the 1800s by offering a sudden source of high prestige which allowed uvulars throughout western Europe a chance at competition with the apical trill in polite society. Runge in his book gives several examples of references to uvular or velar /r/ in German well before 1800, and proves fairly convincingly that it existed as a stigmatized variant. The uvular /r/ of Eastern Yiddish seems to predate large-scale migration of Ashkenazim into Eastern Europe (and therefore predate Parisian uvularization by a wide margin) and raises the strong possibility of a uvular /r/ (presumably submerged in lower sociolects) in varieties of Middle High German. Van Bezooijenhere brings to light the possibility of a Dutch uvular at an early date in his discussion of Montanus' Spreeckonst (1635), an early Dutch orthoepic work which unambiguously describes an apical trill as normal, but refers mysteriously to another, low-prestige type of R used by some. The term Montanus uses for this other type of R, reminiscent of the sound of crows and ravens, is kraekletteren "creaky letters." Tempting though it might be to look for some kind of connection between these multiple, and seemingly independent, early sites of uvular /r/ in low prestige European speech, none of this is actually very surprising. Uvular [ʀ] is a common independent innovation in many languages that have apical trilled [r] and there isn't anything peculiarly European about it. Low-prestige uvular rhotic realizations are attested in medieval Arabic dialects of Mesopotamia, and survive today in the nearly moribund traditional Christian and Jewish dialects of Baghdad. Add to this the morphophonemic alternations in Akkadian which suggest a uvular rhotic, the [ʀ] allophone of /r/ attested in Tiberian Hebrew, and by implication the phonology of the Aramaic dialects underlying the latter, and uvulars appear to have an extremely long history of coexisting with apical trills in Mesopotamia and the Levant, just as they do in Europe. The long and short of it is that although uvulars may be cross-linguistically rare, and although their wide adoption in prestige accents in 19th century Western Europe is likely not entirely coincidental, the innovation of a uvular [ʀ] as a variant of an apical trill is not exactly a bizarre or unusual occurrence in the world’s languages and one shouldn’t read too much into it. A perceptual proximity can explain how two sounds with different articulatory features can be related diachronically. The perception is also an element to take into account in the evolution of the languages. Not the answer you're looking for? Browse other questions tagged phonetics historical-linguistics germanic-languages romance-languages or ask your own question. Does the French R-sound come from Germanic influence? Why do phonemes such as /r/ and /ɾ/ evolve into uvular sounds like /ʀ/? How did 'cocodrilo' originate from 'crocodile'? Do the words “angst” and “anxiety” share a common root? 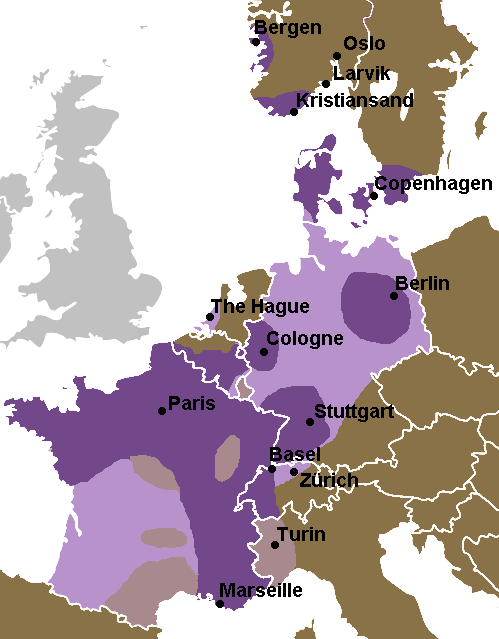 French dialects from west to east: no distinct breaks, blend into German? Where might the given name Xelefon originate? Where did the use of the two auxiliaries in the Romance languages come from?